Aberdeen manager Derek McInnes confers with assistant Tommy Docherty (left). 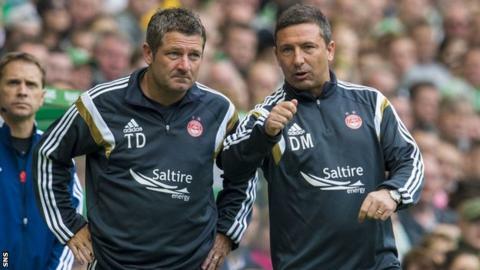 Aberdeen manager Derek McInnes was adamant his side should have had a late penalty as they fell to a 2-1 defeat away to Celtic. David Goodwillie halved the deficit after Jason Denayer and Kris Commons had given Celtic a seemingly comfortable lead. Niall McGinn then rattled a free-kick off the arm of Commons inside the box. "I don't want to be a manager that's constantly moaning at officials, but it is a penalty," said McInnes. "Commons has used both hands to stop the ball going towards goal and he's 10 yards from the strike, so I do feel there should be a penalty kick in that instance. "I think a penalty at that time. There's enough time to go on and win the game. "We were definitely on the front foot and the ascendency was with us. I thought Celtic looked fragile and vulnerable at that stage." The Dons took their time to make their mark in the game but finished with a flurry, leaving McInnes encouraged. "You're always disappointed when you lose a goal from a set-piece and the goal we lose is avoidable," he told BBC Scotland. "I thought Commons was problematic for us in that opening half an hour. He was finding too much space. "We were a wee bit disjointed and that was allowing him to find space and they were picking us off at times. "The finish to that first half was encouraging and far more like us. We talk about the second half and what we want to improve on and we lose the second goal more or less right away. I think you also saw the other side of Celtic when we got on top of them, got a goal back and caused them problems. "Although it's a deflection, Commons should never get the shot away. "You see Celtic at times playing with that confidence and swagger when the result is going their way, but I think you also saw the other side of Celtic when we got on top of them, got a goal back and caused them problems. "Overall, we've lost the game, but for periods we were very good. "I've no doubts that we can cause any team problems when we're bang at it and today, although we're disappointed, there's still enough to show that we're going to have a decent season."